Christmas arrived a little early for 13 Pensacola State College students after they recently were awarded scholarships. The awards were a portion of $24,755 in scholarship funds that Pensacola State received from Florida Blue, the Helios Education Foundation and Bank of America’s Dream Maker program. 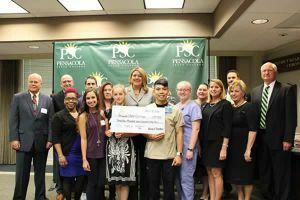 Pensacola State’s award was part of more than $893,000 in scholarship funds the three entities contributed to the 28 institutions that make up the Florida College System. Florida College System Chancellor Madeline Pumariega presented the funds to Pensacola State President Ed Meadows during a ceremony held Friday, Sept. 30. Jerson Armulla, a radiology program student who moved from the Philippines at age 12, agreed with the president. Pumariega congratulated the scholarship recipients, and added she was a product of the Florida College System – a student-athlete at Miami Dade College.